A die attach film or DAF, can be an alternative to using epoxy tubes. 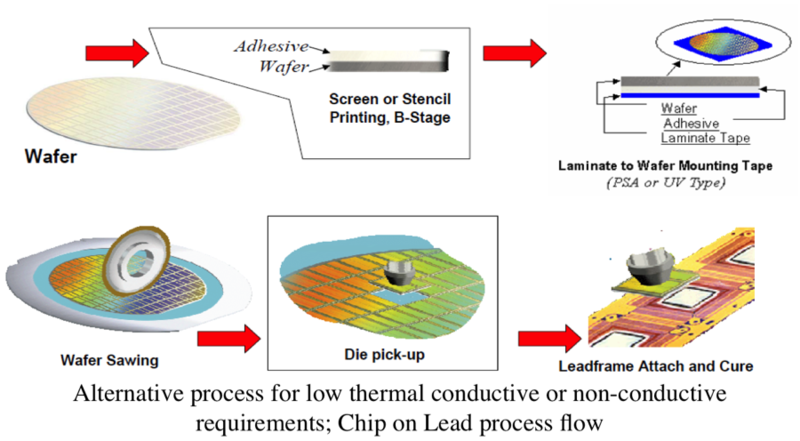 This is a high volume manufacturing process, and die attach films can be used where one does or does not need an electrically conductive path between the die substrate and the leadframe. 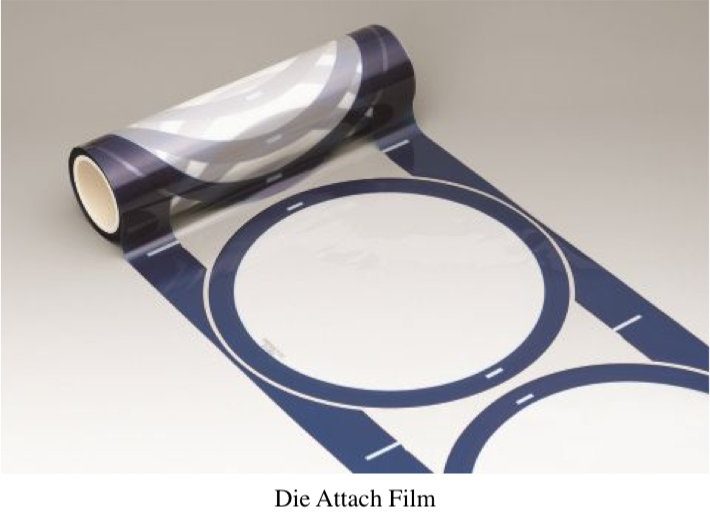 Die attach film can also provide a more uniform bond line, create a uniform fillet, and avoid die tilt problems. Die attach film typically comes in rolls like we picture here, where the DAF is the same size as the wafer. Accordingly, these rolls can be for 150, 200, or 300 millimeter wafers. Another approach to die attach is a liquid coating applied to the backside of the wafer. This is sometimes referred to as B-stage. A B-stage epoxy resin is a term used to define a one-component epoxy system, using a low reactivity curing agent. This product can be partially cured or “pre-dried” as an initial stage after being applied onto one substrate/surface. It can, at a later time, be completely cured under heat and pressure. This is significantly different from a typical A-stage epoxy system that is provided in a one or two component format and, is cured in one step at ambient or elevated temperatures. B-Stage can be squeegeed on to the back of the wafer, and it can be both insulating and conductive. It is also cheaper than a die attach film. These materials are pre-cured so that the die saw doesn’t spread any conductive material. This can be a good alternate process for devices with low thermal conductivity requirements, and works well with a chip of lead process flow. Die attach can be critical for certain applications. Power dissipation is one consideration that is quite important. If the power dissipation is greater than about 2 or 3 watts, then engineers normally select die attach materials with high thermal conductivity, in the range of three to seven watts per milli-degree Kelvin. This is usually done in conjunction with a heat slug or power pad to aid in the removal of heat. 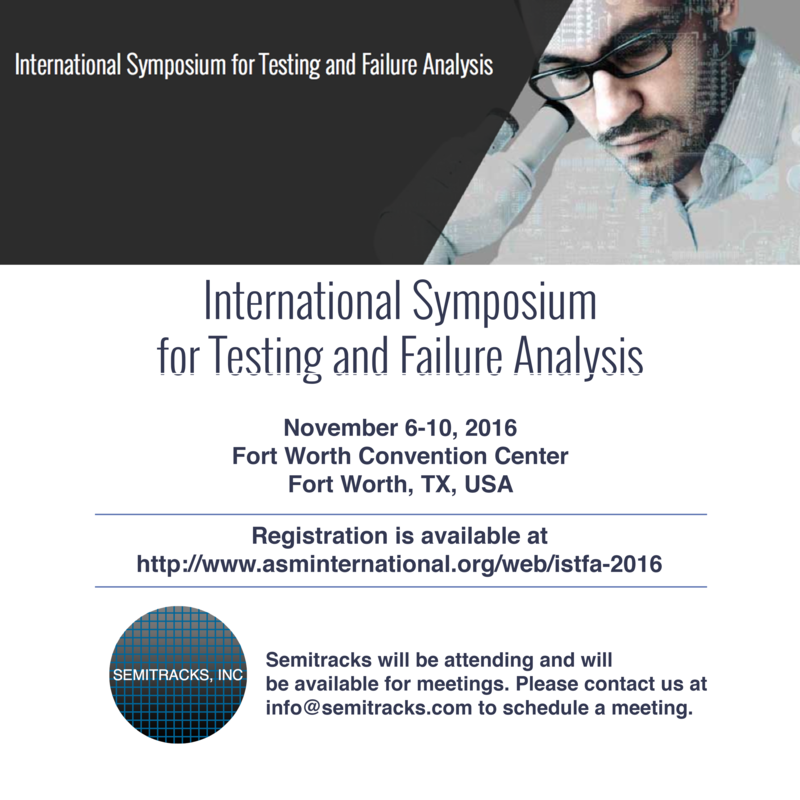 One must watch for die attach delamination, as this can result in sharply higher temperatures. For lower power devices, a die attach thermal conductivity in the range of 0.6 to 2.0 watts per milli-degree Kelvin is acceptable. The die attach can cost less, because less silver is needed to obtain these lower conductivity levels. 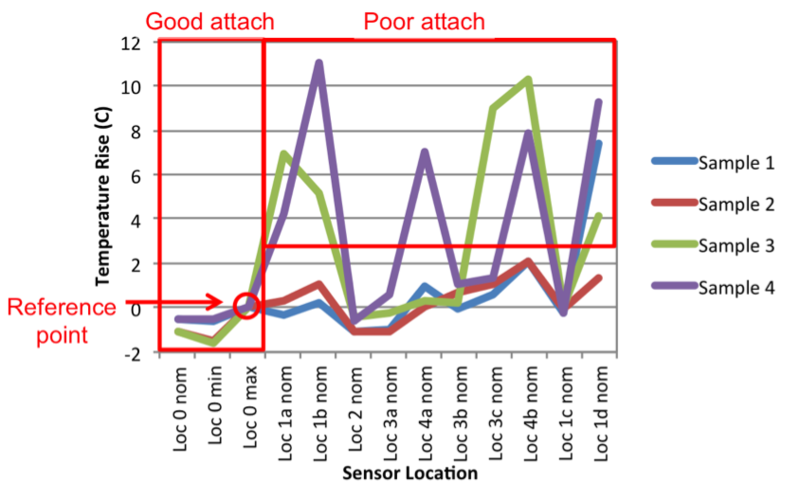 The above chart shows data comparing nominal temperatures to the change in temperature at different sensor positions within the chip. The left side shows three regions with good attach from several devices. We use Location 0 max as the reference point, so it shows 0 degree rise. The regions where the temperature rise exceeds 3 degrees would indicate die attach delamination. In this month’s technical tidbit, we’ll briefly discuss Electron Spectroscopy for Chemical Analysis and X-Ray Photoelectron Spectroscopy. Electron Spectroscopy for Chemical Analysis, or ESCA, and X-Ray Photoelectron Spectroscopy, or XPS, are two different analysis techniques obtained from one stimulation method. As such, they are usually performed and analyzed together. ESCA/XPS allows the quantitative analysis and identification of chemical compounds. An X-ray source ejects valence band electrons from the sample. The binding energy of valance electrons is specific to a chemical bond. Spectroanalysis of the binding energies is used to accurately identify chemical compounds. ESCA/XPS is useful for understanding instabilities in oxides, particularly the oxide-silicon interface. By instabilities we mean broken and unterminated bonds in the oxide layer. These bonds can trap and detrap charge, leading to changes, or instabilities, in the behavior of the MOS capacitor, and therefore instabilities in the behavior of CMOS transistors. Data from ESCA/XPS can indicate need for steps such as pre-oxidation cleaning that can improve the yield in a process. This technique does require that one look at a large area test structure, since the x-ray source has a resolution of approximately 7.5 microns. Q: What is the definition of "dump rinse”? A: In semiconductor processing, a dump rinse is technically called a Quick Dump Rinse (QDR). The quick dump rinse tank is used to remove residues from the wafer surface after chemical processing. After a step that involves chemical processing, the wafers are immediately placed in the QDR tank for rinsing. The term “quick dump” describes the rinse technique used. The system fills the tank with deionized water to the point of overflowing for a short period of time (typically 30 seconds to one minute), similar to the way the overflow rinse works. Next the system opens a door on the tank bottom, draining the tank very quickly. The system refills the tank and repeats the process, typically four to six times. The advantage of the QDR tank is that it helps to remove viscous chemical residues on the wafer surface by introducing shear stresses during the dump phase of the cycle.